Sometimes, the ears hear a different story than the one your eyes are telling you. Case in point: the current saga going on with Paul George and his injured shoulder. The superstar told reporters during the Thunder's Monday shootaround that he was healthy enough to rule out any injury problem, but was wearing an enormous bag of ice on the area while he told the tale. Playing through it and being healthy are completely different. Everyone appreciates him giving it a go, as he's needed on the court if this team has any shot of winning this series, but icing it up after practice isn't exactly a comforting sign. The Thunder and their fans have to hope PG13 is telling the truth, otherwise they're cooked in this series against Portland. George did put up 26 against the Trail Blazers in their Game 1 loss, but only shot 8-24 in the process. He claims his struggles were more rhythm-based since he hadn't shot the ball in four days after he was listed as day-to-day with that shoulder injury. 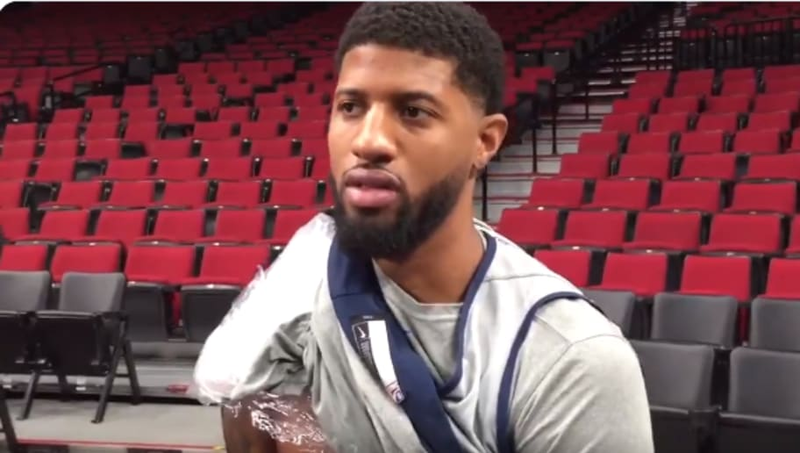 Paul George said today that his shoulder is pain-free. "It didn't have any effect during the game." Re-iterated yesterday's performance was more rhythm related. This is something we'll have to wait to see. If George comes out firing in Game 2, then we can write this injury off and enjoy an exciting series. If he struggles again, call his problems whatever you want. It won't matter since the Thunder will be toast anyway.